I've been doing some spring cleaning today and decided to hold a little giveaway. This vintage leather Coach bag is from the late 1970s and belonged to my mother. 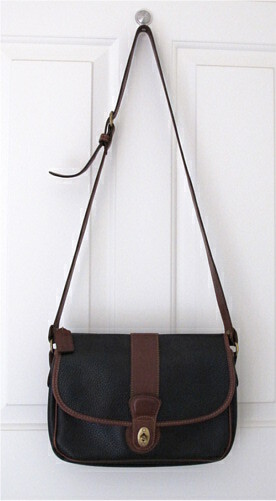 The measurements for the bag are: 11" (W) x 8" (H) x 2.5" (D) with a strap drop between 20" - 24". I love it and it's still in pristine condition (minus a few scuffs as shown in the second picture). The interior cotton lining is practically spotless. However, I think the strap is a little too long for me so if you're regular height, this would look really nice for summer with a dress and some clogs. It's really old school, complete with the brass turnlock and duo color and is made in the United States. Shipping within the United States included. If you're not the US, you can still win this, just email me and we can work out the shipping rates together. All you have to do is just leave a comment with your name and email address e.g. : name [at] emailaddresss [dot] com and I'll run a random number generator draw lots (cliched I know) at the end of the giveaway. Closing date for entries is on April 1, 2011. OMG, Amanda. This bag is AWESOME. Please count me in! I love this too. Please put on the list! Thanks for enthusiasm, but if you don't want to leave your email, you can just send it to me! I have to find a way to contact you if you win! Thank you. wow, I'd have difficulties myself to give this bag away haha.